Description: This one is for all you audio geeks out there. If you are going to play with MIDI accessories you'll likely need a cable. 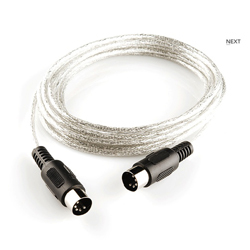 We have a nice 2 meter (6.58 feet) MIDI cable that you can use with all of your MIDI devices. Great for projects using the MIDI Shield, and the MIDI breakout. Now go synthesize something!